What is in a name? Everything your very identity in this world is your name. Let us accept the fact that we all want to lead a successful and fulfilling life. Everyday we try to excel and strive to reach our goal viz., a successful business, a better car, a well-deserved holiday, a pay increase, a better career, a successful marriage, a beautiful dream house, etc We can get all these things and much more.... the question is how? Well, the answer is simple the key to success lies in your name! Your date of birth cannot be changed, so the only option is to change your name to vibrate in harmony with your Birth date. This will certainly improve the quality of your life. Astrology and Numerology are fascinating subjects that enable us to understand our future and help us to lead a better life. Astrophysicists confirm beyond any doubt that with mathematical calculations, we can plot the movements of all the planets at any given time. But Astrology is a complex science involving various permutations and combinations to interpret. Also it is not correct to categorize all human beings born in a particular month to have the same characteristics and lifestyle. This is like saying that the total population of the world is equally consisting of only 12 types of people depending on their zodiac signs. Twins born in a family are different. Why? They are brought up in the same environment - but are they same? NO! This is due to their different names. Sometimes, we see in life, that many peoples professions are totally different from what they set themselves up to do in their early years. We have seen millionaires and billionaires, who have not passed their high school grades and more than 99%, have not even attended Business schools. Some of these business tycoons share the same birthday as you but what makes them tick? Obviously, it is their names! Have you wondered why we form a sudden likeness for somebody at first sight and sometimes dislike others without even knowing them? This is because of the vibrations or aura, which that particular individual carries with them. This aura is considered positive and likeable only if the individuals name number is in harmony. When you call Tiwari or any other name, it sends certain vibrations. This pulse affects the subtle inner self of an individual and triggers good changes if the name number is in harmony. Since we cannot alter our date of birth the only alternative is to alter or modify our names to make things better in our lives. Success is all about making the right choices at the right time. By understanding Numerology you can unlock your potential and increase your self-awareness. In simplicity lies the lifes secret. The great things of life are always creative, dynamic and simple. Hence, they are bound to produce happiness, peace and success. Although, Numerology is an ancient science, I have taken this opportunity to bring this wonderful and marvellous science which is so simple in its essence in an easy to understand and implement format. This science follows the simple law of mathematics, with which the whole universe functions. Also, this science can be used to understand the highs and lows, which we are likely to undergo in this life and act accordingly. For example: When it is winter, snowing and cold, we can still survive with warm clothing, heaters, etc., the other alternative being, taking off for a sunny location. In this way, we are not harming or changing the way of nature; rather we are only protecting ourselves from the effects of nature. In the same manner, Numerology can be practised in harmony with nature and anything in harmony with nature is blessed with creative intelligence. It gives you the option of changing your name to a more suitable harmonious one, which will enable you to ward off the ill effects and you will be able to lead a powerful and successful life. This book helps you to become what you want, by following the least line of resistance. Nature proves that rivers follow the least line of resistance. Hence in understanding and following Numerology, you can become what you want to be in this life. 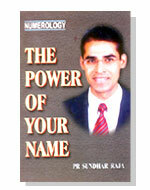 This power lies in your name number, provided it is in harmony with your birth numbers. After understanding the fundamentals of your birth number, destiny number and name number, you can, not only interpret the past, present and the future but also change your future. The purpose of this simplified version is that it should benefit as many people as possible and help them lead a life full of harmony without ill health and suffering. I hope that you will all benefit from this science and will help your children, friends and relatives to lead a successful life. Numerology is user friendly, easy to understand and accurate ( the simple mathematics of 2 + 2 can never be any other number but 4 ). It consists of 9 basic numbers from 1 to 9; the sum total of all other numbers in single digit will fall only within these 9 numbers. To understand yourself, first you should calculate your birth number, destiny number and name number. It is very simple; just write down your date of birth and your name. Example: Let us calculate the birth number, destiny number and name number for N. Vijay Sharma born on 14th September 1963. Now write the date of birth in numbers as 14-9-1963. 14 = 1 + 4 = 5. Birth number denotes your character; your basic likes and dislikes, health and emotions. The destiny number is the sum total of the date of birth with the month and year. Therefore add all the numbers together (i.e.14-09-1963) and keep adding them until only a single digit remains. i.e. 3+ 3 = 6. The destiny number of Vijay Sharma is number 6. Destiny number denotes your career and how successful you will be in life. It denotes the least resistance path you should take to achieve your goals. An Italian inventor, Marconi, made the first wireless transmission in 1895. The name MARCONI has the name number 5, his invention was made in the year 1895 again a total year number 5 and using this breakthrough BBC initiated experimental television broadcast in London during 1935 a total number 9. You will understand this similarity between 5 and 9 in detail in chapter 5. Likewise Number 4 has played a vital role in the invention of the calculator and computers. IBM built electromechanical calculators in 1930, John Vincent Atanasoff built the first truly functioning electronic computers in 1939 and Microprocessor based computers were only introduced in 1975.